Anyone found a product that will clean the residue from the stick on weights from the wheels. 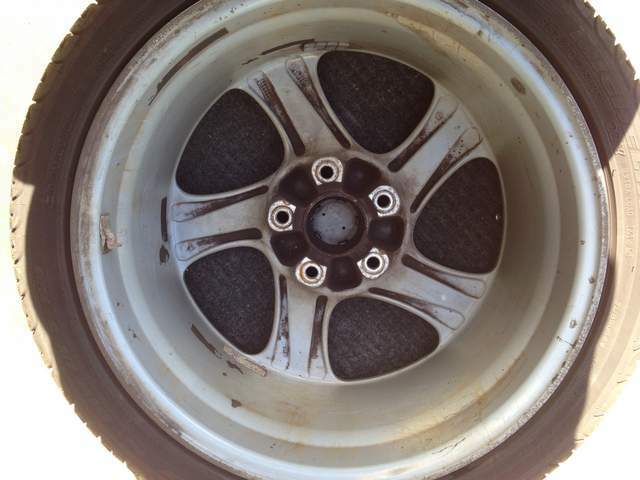 I have not found anything that will desolve it and scrubbing and scraping ruins the finish on the wheels. Goo Gone and a plastic scraper. 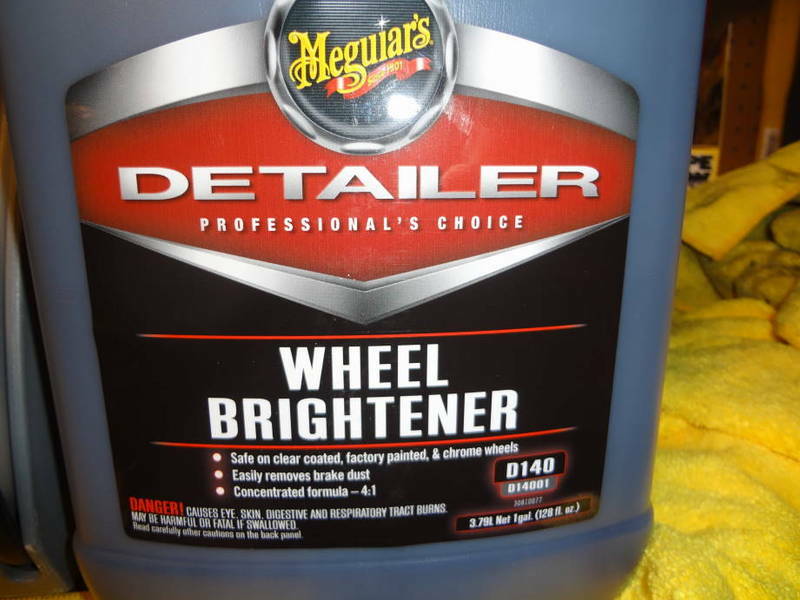 Meguiars sells a very potent wheel cleaner under their pro-line. You would have to order it online. And its not for amateurs, you have follow the instructions to the T.
But first I would give the guys at Autogeek.net or chemicalguys.com a call for a less invasive route to get rid of adhesive. On my race car I end up using WD40 or similar, it seems to work about as good as anything else. +1. I use this stuff too. Works great. Goof off worked for me. Brake cleaner. I put that **** on everything! Assuming you have painted wheels (not chrome plated), mineral spirits (also known as paint thinner) works and is fairly gentle, or toluene if you have some and want it work a little faster. 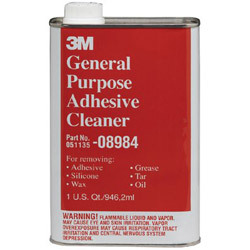 The other products here are probably also good (like the 3m adhesive remover - naphtha and xylene or other not instantly evaporating hydrocarbon solvents), but I advise against using brake parts cleaner, lacquer thinner, or anything with acetone - this is too aggressive for the paint that's on the wheel (will eat and etch, and abrade away the surface of the paint). The "wheel brightener" (with some nasty acid of something like hydrofluoric acid, I'm pretty sure) is also not really the right tool for the job for removing adhesive, (or road tar like deposits, for that matter). It works great for cleaning baked/caked on brake dust though, and is the only thing out that that can really remove aluminum oxide deposits in the pockets of the wheel where there is no finish at all (or in the locations where the finish has been pitted or chipped with dirty looking surface oxides). Where you just have caked on brake dust over painted surface, there are gentle on the finish (but expensive) wheel cleaning products that work nearly as good as the acid or caustic based cleaners. 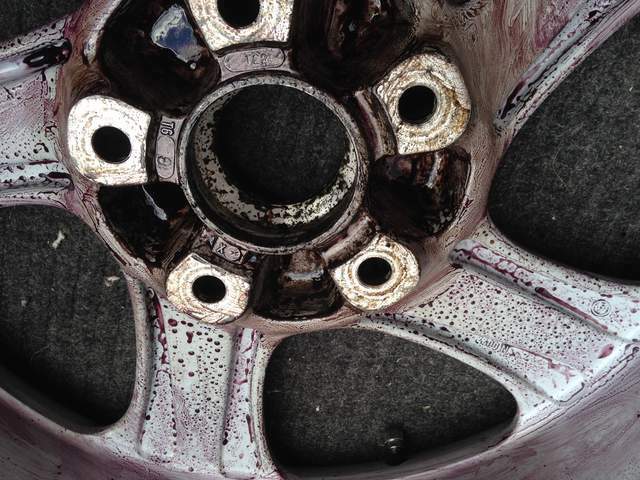 (Example: Sonax wheel cleaner plus) These generally turn purple after exposure to brake dust or other iron deposit. The do not remove aluminum oxide deposit from the unfinished or chipped areas like the hydrofluoric cleaners do. The combination of a hydrofluoric cleaner and a solvent (not at the same time necessarily, but alternating), will give amazing results, but the acid may etch or damage the paint a bit (recommend not letting it dwell on paint any longer than needed, and doing it only very infrequently. The acid cleaners should kept away from the brake components. This means emoving wheel from car. 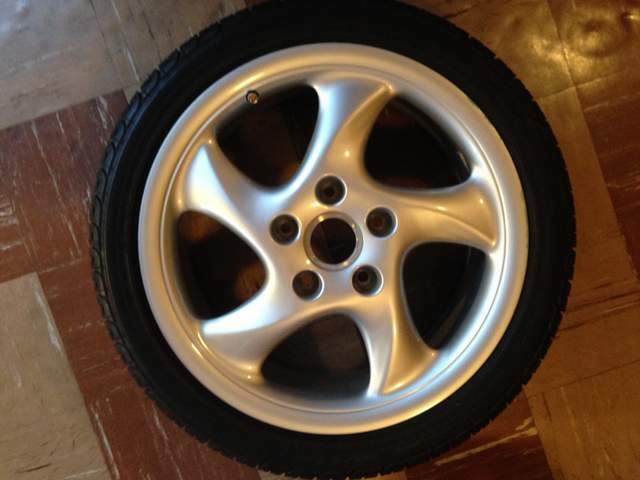 Be sure to not let the outer surface of the wheel fall on the ground when cleaning the wheel off the car! 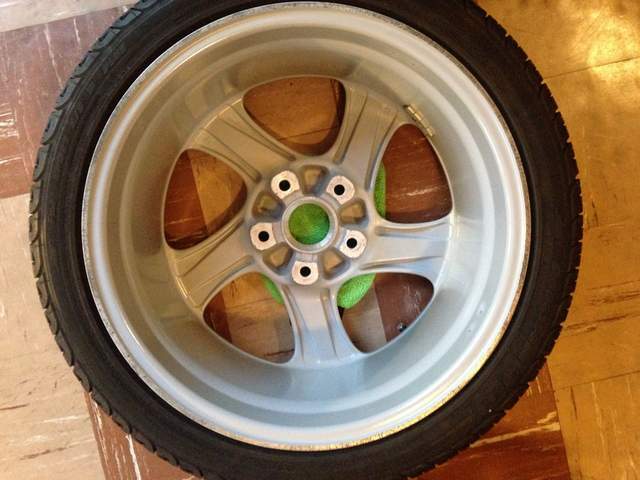 If you do thoroughly clean your wheels, apply a sealer to make them easier to keep clean in the future. I also tried polishing the inner barrels of the one of the 18" turbo-look wheels (pictured below) I cleaned on my 986, and it was such a noticeable improvement that I will definitely be doing the rest the exact same way. Multiple applications of th cleaning products, manual agitation, and persistence is required - there is no "quick fix" to cleaning wheels that are really dirty without damaging the finish. Last edited by jakeru; 05-07-2015 at 09:05 PM. I like using Sonax because it can remove the grime and brake dust without scrubbing too hard. 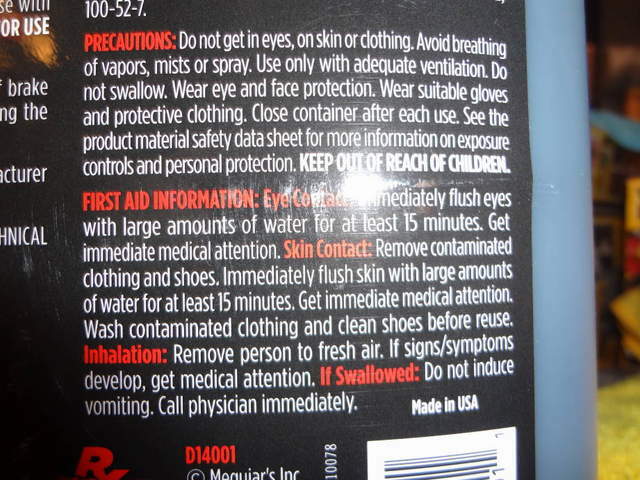 Yes, that might be the only detailing product I've seen that says Danger! on the front of the label. Many bad things would happen if they sold over the counter at your local Pep Boys. The acid cleaners should kept away from the brake components. This means emoving wheel from car. Very true you should work your way up the bite chart before going to the acidic option. Which is what I presume the OP has done. And definitely remove the wheels. Those are excellent results you posted. Biggest mistake/lesson I learned: be very careful when handling a removed wheel to not let it fall on its face, (which can damage the wheel)! The wider Porsche wheels are more stable than most. Wheel cleaners with hydrofluoric actually are available over the counter. I got mine (Eagle One Mag Wheel cleaner) from the local O'Reiley auto parts store. (I presume it's basically equivalent to the meguiars product.) Reason I originally my hydrofluoric cleaner was not to clean wheels, but to remove aluminum oxides for preparing dirty aluminum parts for TIG welding. I found the orange hand cleaner to work the best got most of the dirt and grime off then I wet sanded. 400,800,1500,2000. I then used polishing kit from Eastwood.